I'm sure he won't need much introduction to most of you, as he is EVERYWHERE! Being super helpful and fixing up folks with code snippets at every turn. Dustin, you are truly an asset to our community here and can be counted among the list of truly helpful and knowledgeable folks here. And an equally important feat is making it this far with over 650 gifted points! I'm now going to reveal that you are indeed related to Mr. McDreamy (for all you Grey's fans) Patrick Dempsy and then stand back while all the girls come running for your autograph! LOL hey bud congrats :slight_smile:and a warm thanks again for this mornings brainstorming session. It only took me three years but I finally made it! haha. I couldn't have done it with those 'friends' in high places. MTB1701 and tom.eagles among the top contributors to my point count. I hope to keep finding the time to stick around and help where I can. You deserved them all, the amount of custom coding quick plugins you have helped other members out with along with identifying which lines of code or css people need to change has been awsome, couldn't have been knocked of my sticky perch by someone better cgts. So what does this "custom" next to my name mean? Congrats @maxaud - at this rate it feels like it is going to take me 3 years, but I am finally ok with that because I have learned a lot already being here and I am getting so many ideas to use the various plugins available in my business. Who is Mr. McDreamy? Grey's fans? What team / sport is that? Congradulation Maxuad! I have been looking forward to this! Truly well deserved! I am wondering why your not on sticky? That is what i told him in an email! "Custom Dustin"
I so pray i will find a WP hook up close by, that would be helpful. I think i will attend a few Word camps, and see if i can figure out how to host one, then start Networking for some lessons. Only i think i have already overbook 2013. About 15-20 min out side STL MO. when i am home. which lately is about 1 weekend every 2 months. I am hoping to start splinting my time 50/50 between ATL GA. and STL MO. All the traveling is physically catching up with me! Congratulations @maxaud I almost missed that you made it! This really needs to be placed as a sticky, On Top so that if (like me) someone misses getting on her for a day or so they can still see and congratulate you! @Kimberly can you make this a sticky please? @Dean Kaus it already is a sticky has been since she posted it. @Tom it is indeed not a sticky from what I see. Until I posted I didn't see it until I hit page 6! If I hadn't been looking for a post that was farther down the list I would have missed it altogether. Maybe what I'm thinking a sticky is different from what you're thinking. When @patrick, @MTB1701 and many others including mine were listed at the top of the main page and was always on the top until another lifetime member took the spot. I really would have missed it if I wasn't trying to follow up on another post. and since I wasn't one of the first ones and nearly missed it Congratulations again @maxaud well deserved! I have unstuck and made it a sticky. For some reasons it was not showing under featured. It had been set as a sticky since the word go unfortunately for some reason it hadn't been set properly so PC just set it again now. @tom all is good possibly I'm thinking of sticky as remaining on the top of the list and realized after @pc fixed it it now shows up at the top. Not sure if featured and sticky are 2 different things. Anyway all is good and I didn't miss his hard work being celebrated. BTW @Tom congrats on becoming Staff! 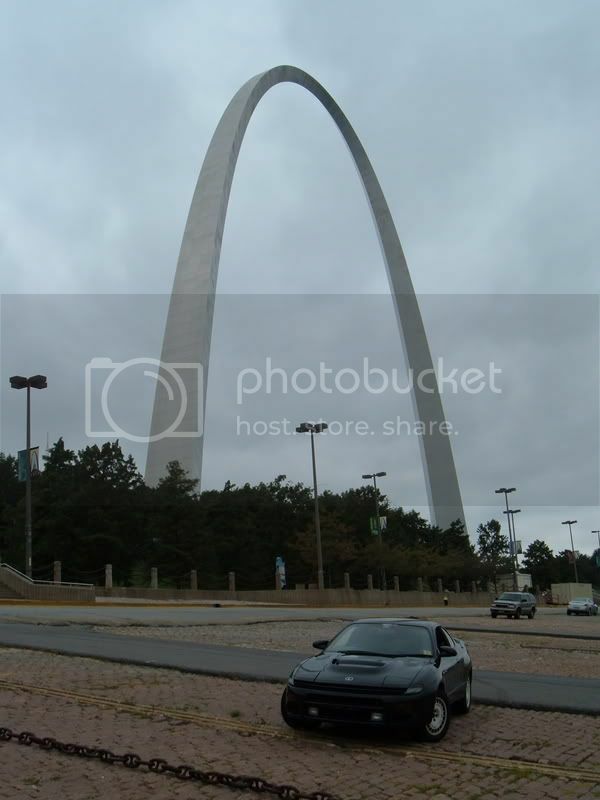 MTB1701, I've been to the arch a few times, pretty fun place! @Dean Kaus thanks, it's one extra click that had been missed that's all it was set a category sticky not a sitewide sticky. But alls good now. The 1st time i went was on my 8th birthday, Once we got on the elevator my family learned i was mildly closterfobic. lol When the elevator started shift to compensate for the curve of the arch, they found out a could scream and cry like a little girl, when we got to the top and looked out the window they found out i was scared of heights. My brother was stationed at the base in Lebanon nearby. Last time I was in the park I found $20 on the ground so was a good day! Another time when I passed through I snapped this picture along the river.. The City Museum is also very fun there! I see the landing pavement, the river was to your back / right, the casino was to your front / right, and my guess from the angle would be you just left the MCy D's lol! Congrats on making it to Life Member, @maxaud. Over the last year, I've been coming here and this has got to be one of the most interesting and helpful communities that I've ever found. Thank You for your service! I see the 1st Signal Brigade insignia, but i do not recognize the two above it. Like the Bulldog, My dad was / is a "Devil Dog" I am wondering if you served in both branches, or does the Army have a bulldog mascot too? Again; Thank You for your service! Well I don't know how I missed this for a whole 3 days!!!! Thanks guys!, and as MTB1701 stated fosterdv, thanks for your service! Welcome to the LTM club Dustin! Congratulations! I wish I could participate more recently to work towards mine, but life doesn't always make that easy! Thank you both @MTB1701 and @maxaud! While I was in the 1st Signal Brigade, I was in a Cable platoon, and were Cable Dawgs.. and you can't see due to how the picture is cut off, but he's on a couple reels of CX-11230 (Tactical Coax Cable). Just the perfect inspiration to push a newbie like me to getting involved! Well done. One day I hope I earn the priviledge to join you in the ranks! Hi - Good one this is probably the best support community that I have come across. Thank you and keep up the good work! Regardless, glad you finally made it - it's a great club to be in isn't it? Looking forward to more interaction with you in the near future. Hey guys, checking my records and it looks like my membership was rebilled this month. Is this something that you could look into? Ouch gimme a sec will do. I see the refund has been issued. Much appreciated. I guess what happened it was ya custom membership type that caused the issue. but glad we had it fixed only took a few mins. Hope you are well. Yeah, my profile says that my membership expires next year. Has the exact moment of my death been determined? Just let us know before it gets to the expiry and we'll adjust them.